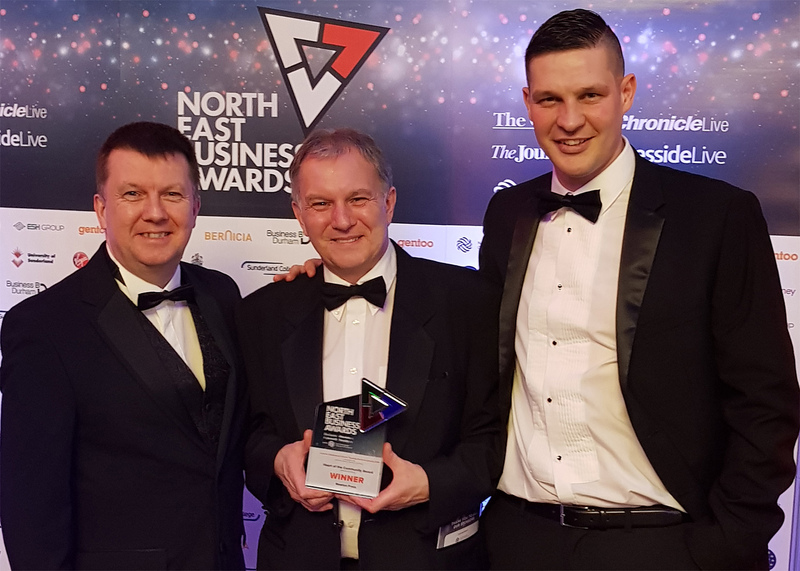 Newton Press, Winners of the County Durham Environmental Awards 2018 in the ‘Greener Business’ category, were delighted to have also won the “Heart of the Community” category at the Durham, Sunderland & South Tyneside regional heat of the North East Business Awards 2019. Newton Press have very strong roots with their local community, so much so that the late founder, Syd Howarth, was nicknamed ‘Mr. Newton Aycliffe’ and went on to be awarded an M.B.E. for all the work he achieved in the local community, indeed since his very sad passing, the local council unanimously decided to name a street in his honour. This hard work and dedication is now carried on through his three sons, Paul, Stuart and Chris as well as all the staff at Newton Press. Whilst Newton Press are celebrating over 56 years in business and previously winning the ‘Heart of The Community’ award through Aycliffe Business Park, nominated by the local businesses; it is the future that they look forward to and playing a huge and instrumental supporting role in the local community. They will continue to achieve this by remaining the go to source for all local news and content, this interaction that they have with their community has been built over many years and they continue to integrate more with the addition of a community radio station, set up by Paul Howarth and run with the help of nearly 40 local volunteers who are also dedicated and liaise directly with the local community. Founding community organisations including a Residents’ Association. Enhancing the environment at the entrance to the town. Sponsoring, printing and fitting the town entrance welcome signs. Initiating and supporting a War Memorial for the Town. Free printing for numerous local charity events. Free editorials for charities and new business start-ups. Pioneering Care Partnership – we have donated over £10,000 worth of free print and editorial space in the newspaper to this organisation. Supported BeeHappy 2Gether Charity launch with various printed materials, adverts and editorials in the newspaper and Aycliffe Radio presenting throughout the whole launch, live from the event. Christmas Live Concert working with Town Centre Management, handing out presents to children in the town during the day. Annual School Year 11 Awards to both our senior schools. Corporate sponsor of Pioneering Care Partnership and Butterwick Hospice. Blue Light Day supporting emergency services. Regular radio interviews with local residents, businesses and politicians. A member of our staff is on the Board of Directors for Aycliffe Business Park. A member of our staff has been on the committee as a volunteer for GAMP as the ‘Business Representative’. A member of our staff is volunteering as an ‘Enterprise Advisor’ working with schools and students to help them with career choices and relevant skills and experiences as outlined by the ‘Gatsby Benchmark’ for the Tees Valley Combined Authority’. Winner of the Environmental Awards 2018 in the ‘Greener Business’ category which cements the companies aim; to produce environmentally friendly print using materials from sustainable sources without the use of chemicals or contaminants, making use of world leading eco-friendly technology. As part of our sustainability programme we were also involved in a volunteering event where we undertook tree planting for the day. The award was sponsored by Gentoo who were very generous in their praise of the work Newton Press do in their community. And all the time, they remembered the father of the company, Syd, and his guiding passion and enthusiasm for the town and people of Newton Aycliffe.